This entry was posted in Style, Summer and tagged date night, skater skirt, summer style on July 23, 2018 by Jalpa. This entry was posted in Style, Summer and tagged flare skirt, summer style, white tunic on July 20, 2018 by Jalpa. This is one of my favorite and go- to summer outfits. I always love mixing patterns and colors in my outfit. Adding a bright statement necklace to the outfit adds the much required pop of color. This entry was posted in Style, Summer and tagged animal print, black strap wedges, bubble necklace, joie, shorts, style, summer style, tory burch wristlet on July 18, 2018 by Jalpa. 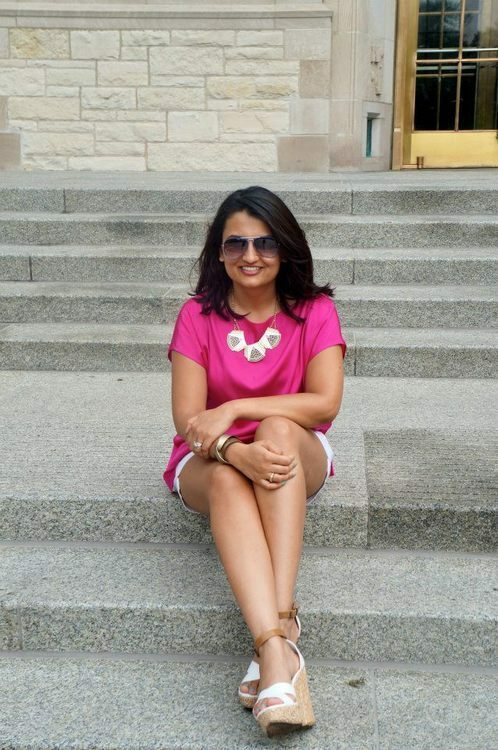 This entry was posted in Style, Summer and tagged black and white necklace, pink, silk blouse, style, summer style, vince, white shorts on July 16, 2018 by Jalpa. This entry was posted in Style, Summer and tagged applique, crochet, free people, lace, style, summer style on July 11, 2018 by Jalpa. Ever met a piece of clothing that is perfect for right now!? If I had to pick an item out of my closet to symbolize September – with it’s beauty and it’s late-summer weather, it would be this midi skirt. Talk about love at first twirl!!! The soft baby blue color paired with a peak-a-boo panel is a skirt dream come true. I am head over heels in love with the midi trend (exhibit A and exhibit B). This lady-like trendy skirt is easily going to be my most frequented transition piece with the current changing seasons. Anytime I can find a piece of clothing that is as comfortable as it is stylish, I am immediately sold. This entry was posted in Fall, Style, Summer and tagged Coach sunglasses, fall fashion, Guess, late summer fashion, merona bag, midi skirt, newyork & co., Nordstrom, silver pumps, striped tee, summer style, transition style on September 9, 2017 by Jalpa. Happy Hump Day! In the last few weeks of summer, it is likely to get excited about the new and upcoming fall fashion that is already so prevalent in all the stores. But, when the temperatures are still soaring high it is hard to incorporate fall weather friendly items into your outfit. My solution is to add fall accents. This cotton tee with faux-leather details is soft and breezy enough for a warm afternoon. When paired with a skater skirt in a deep plum color, the outfit will make you look fall ready while keeping you comfortable in the final days of summer. Pair the look with some neutral accessories and a statement necklace to match the high neckline and ready to conquer your day in style. This entry was posted in Fall, Style, Summer, Transition Styling and tagged baublebar, dvf wedges, fall, flower necklace, fringe bag, leather details, marc jacobs sunglasses, michael kors, skater skirt, summer style, transition style on September 6, 2017 by Jalpa. This entry was posted in Style, Summer, Work-Wear Mondays and tagged black and white, casual, jumpsuit, romper, summer style, work-wear mondays on July 24, 2017 by Jalpa. This entry was posted in Style, Summer and tagged boot cut denim, casual, summer style on July 18, 2017 by Jalpa. This entry was posted in Style, Summer and tagged anthropologie tote, blue ruffle dress, summer style, summer sweater, white wedges on June 22, 2017 by Jalpa.